You want to buy the Lenovo MIIX 520? Good news. The first tablet with an 8th generation Intel Core i7 is now shipping in the United States and China. The Lenovo MIIX 520 is one of the first tablets to ship with an 8th generation Intel Core processor. While Lenovo announced it at IFA in September, it is now available in the United States and China. Other countries all over Europe and Asia should follow soon. While the starting price is set at around 800 dollars, you can only buy a higher-end version right now. On Amazon.com, you can get the Lenovo MIIX 520 with an 8th generation Intel Core i7, 8GB of RAM and a 256GB SSD for just under 1020 dollars. Future versions include up to 16GB of RAM, an up to 512GB SSD and optional 4G LTE. The cheapest model is set to feature 4GB of RAM, a 128GB SSD and a 7th generation Intel Core processor only. All other aspects of the 2-in-1 are identical. Even though the MIIX 520 is much cheaper compared to a Surface Pro, it offers a full metal body with fans at the top. On the back, there is an integrated kickstand. We’re getting two USB 3.0 ports and a USB Type C connector. The 12-inch screen offers a full HD resolution with 1920 x 1200 pixels. While the Wi-Fi versions are shipped with a micro SD card slot, the LTE version is not. You can get the Lenovo MIIX 520 with two optional accessories. One of them is the keyboard cover, which looks very similar to the Type Cover from Microsoft. Thanks to a magnetic strip, you can angle the keyboard up a bit. It features a touchpad as well. Depending on the offering, the keyboard might be included – and should be. Another accessory is the new Lenovo Active Pen 2. Like the new Surface Pen or the new S Pen it supports 4096 pressure points. That makes it very precise. Usually, you have to buy it separately. The Lenovo MIIX 520 offers a premium design and an outstanding performance thanks to the 8th generation Intel Core i5 processor. However, the battery life is quite disappointing and the display could be a bit brighter. Because of its affordable price, included keyboard cover and included pen, I think it is a good value. 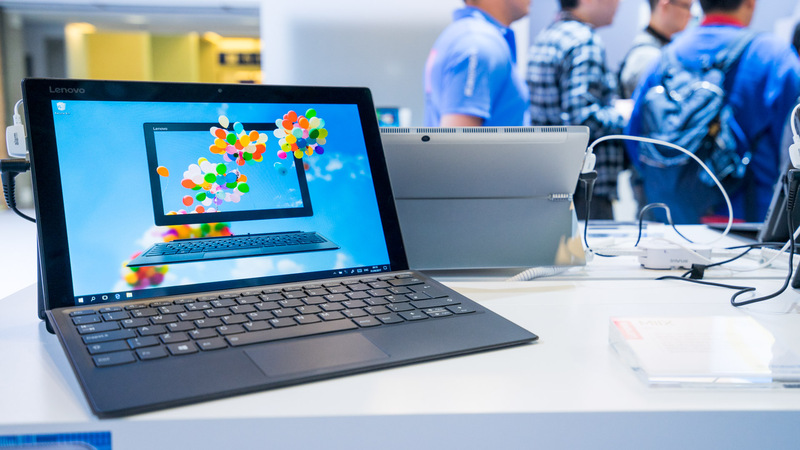 Lenovo MIIX 520 Review: The Best Affordable Surface Pro Competitor?